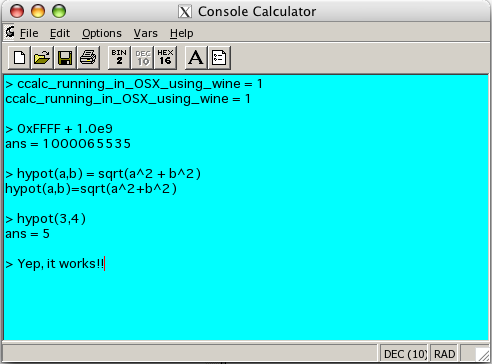 I was motivated recently to get one of my favorite softwares, Sublime Text, running on OS X using Wine, which can run many Windows programs on other platforms, such as Linux or OS X.
I became aware of Wine Bottler, which makes it super easy get Wine running on OS X. I decided to try Console Calculator using Wine, and it works! I’ve only noticed one quirk so far. For some reason, the text-color setting does not work, and text is always black. Unfortunately, by default, the background color is also black, so when CCalc first fires up, the screen looks blank! All you have to do is change the background color to non-black. Oh yeah, and transparency doesn’t work. No surprise there. Now I just have to figure out a way to use Wine Bottler to wrap this in a nice OS X application… currently I have only launched from Wine using the File Manager to launch ccalc.exe. Share your CCalc using Wine experiences!